Studio A is our mastering room. The first key to good analog reproduction is a transparent signal path. Mastering engineer Bob Katz believes that a short, clean path between your analog tape and digital conversion makes the most transparent, dynamic master. The 1/2″ and 1/4″ tape machines are highly customized. For example, the “STAMPEX,” is a unique hybrid of a Studer C37 transport with custom-made extended response 1/2″ head connected to very customized Ampex MR 70 electronics, all-tube. The STAMPEX is quiet, transparent and warm, yet with tight bass. To avoid additional connectors and cable in the path, we do not use standard analog patchbays and patch all analog equipment directly or through a custom analog router using sealed relays. To listen to Masters made in Studio A, visit our Mastering Demo! The most important mastering equipment, Bob Katz! Bob Katz’s Stereoization Process, embodied in his K-Stereo Processor, actually lets the mastering engineer get a handle on the original reverb returns of the recording. It’s been commercialized in several products: the Z System’s K-surround processor, the Weiss DNA1, and the K-Stereo Plugin by UAD Audio. This was custom made for us by Dutch Audio. It’s totally transparent and has a few neat convenience features. 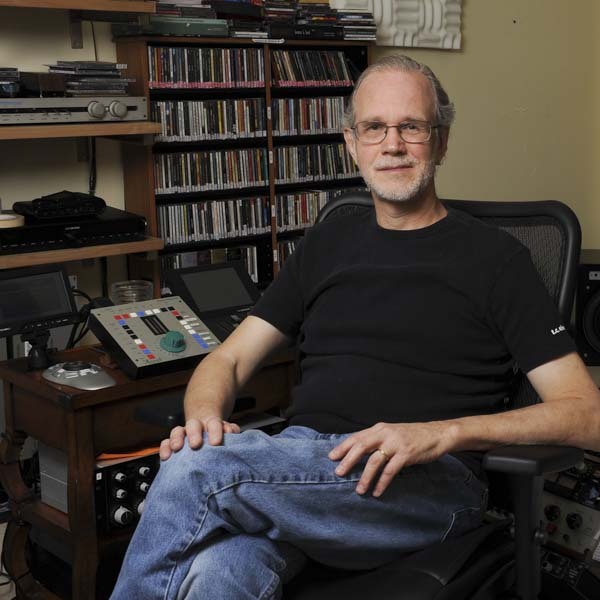 Client Eric Schilling called Bob’s K-Stereo invention “the glue that holds the music together.” When there is a need to help “vocal under” mixes and other such problems, the K-stereo can help to prevent losses in depth and space. Bob’s microdynamic enhancement technique works with music to enhance its impact in a unique way, enhancing punch, but also maintaining the transient impact. If a recording is not percussive enough, microdynamic enhancement can literally remix the percussion level without the traditional sound of squashing and compression. A custom-installed 100 AMP service feeds power to all our gear. The service is over 20 dB quieter than the standard house power lines and has power to spare. This allows us to run each of the power-hungry amplifiers on dedicated 20 amp lines. Our stereo monitors, Dynaudio M5P, weigh 300 pounds each. The unique Dynaudio design reduces ceiling and floor reflections by 75% according to the manufacturer. They sit on custom isolators constructed by Norman Varney of A/V RoomService, Ltd. The isolators resonate at 8 Hz, above which the loudspeakers are isolated from the room. The result is an incredibly quiet and tight response. The room is treated with active bass traps from PSI Audio, passive traps from RealTraps, and some custom-made traps. The center and surround speakers are by Lipinski Sound, designed by Andrew Lipinski. 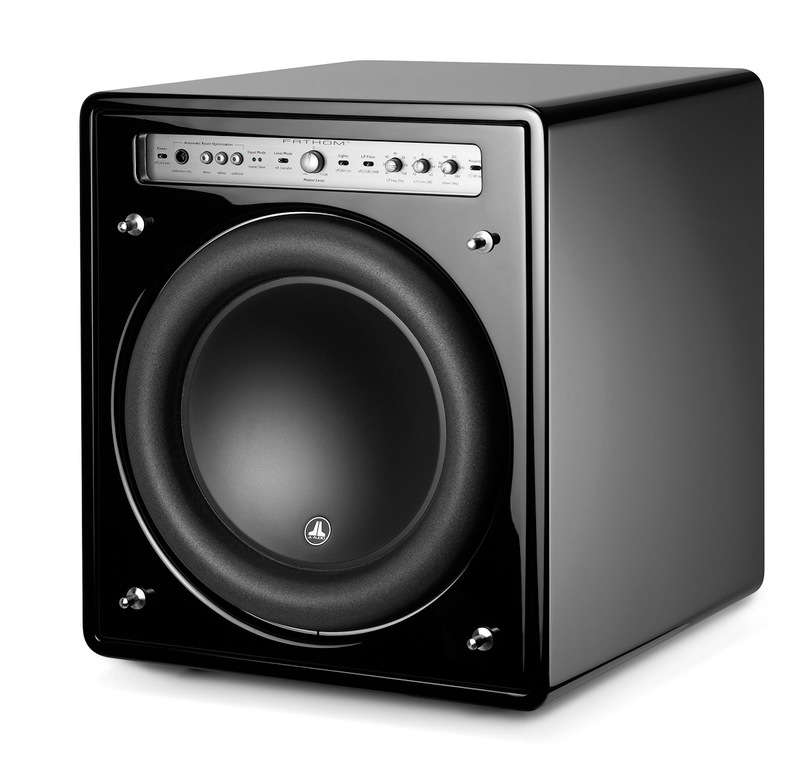 All five speakers are augmented with two subwoofers–JL Audio 12″ Fathom F112 subwoofers crossed over with a steep linear phase Neville Thiele Crossover. The mating of satellites and subs is seamless and perfectly calibrated by use of Acourate loudspeaker and room correction software from AudioVero. Acourate corrects phase, impulse response and time alignment. Response is +/- 1 dB to a target from 17 Hz to 20 kHz. It is -3 dB at 15 Hz! There is over 5000 continuous watts of amplification driving these speakers, sustained by the custom dedicated power line to the studio. Because of the headroom and response accuracy of this system, Bob’s work translates to the widest variety of playback systems. 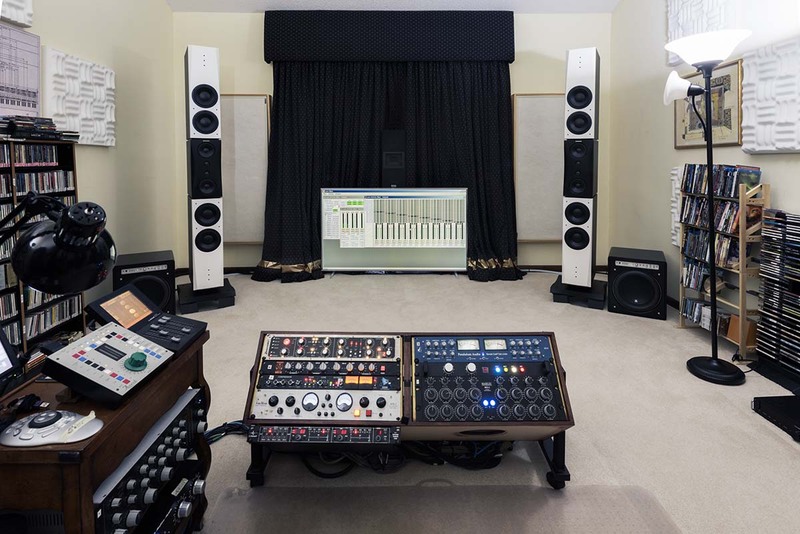 The mastering room is 23′ long in the part between the speakers, and 18′ long at the sides, by 14′ wide with a sloping cathedral ceiling that starts at about 12′ high in the front and goes up to 20′ high in the rear. 3 out of 4 walls are concrete block with one overlayer of sheetrock, and the back wall is double reinforced sheetrock. The walls are selectively treated with Sonex located at precision points to remove flutter echo. There is a carpet over mat on the floor, which is first floor mounted right on the concrete slab. The room is extremely quiet and the air conditioning is inaudible (all noise-making machinery is in a separate room). Clients have remarked that they can hear details in this room that they didn’t know were on their mixes, yet the monitors are musical, involving, and accurate. Clients sit next to the mastering engineer on ergonomic chairs, which have a minimal effect on the acoustic environment. Auxiliary monitoring is with the world’s best headphones, Stax 007 MkII and Audeze LCD-4, each driven by its own DAC and headphone amplifier. After the master is made, comparisons can be auditioned in another room on two representative home-type stereo systems.